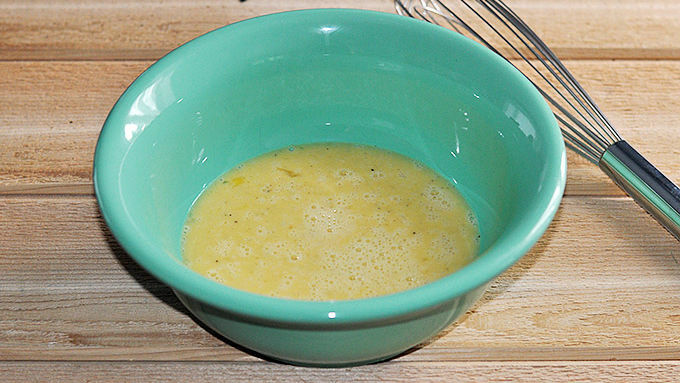 In a small bowl, combine eggs, milk and salt and pepper. Whisk until light. Heat a medium-sized non-stick skillet over medium heat. Add eggs. Allow to cook 2 minutes. 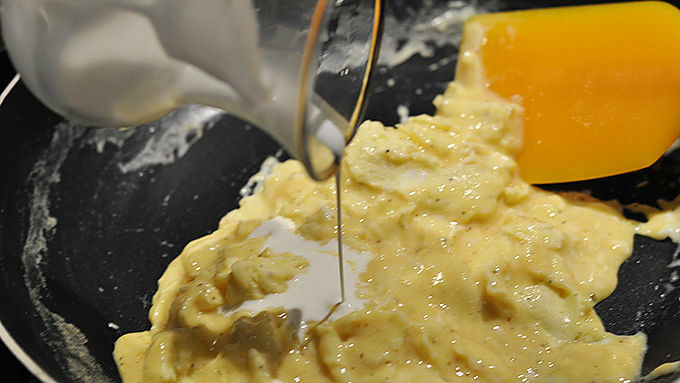 Using a soft spatula, bring up the cooked egg at the bottom, gently scrambling the eggs as they cook. Continue until eggs are soft-cooked but not completely done. 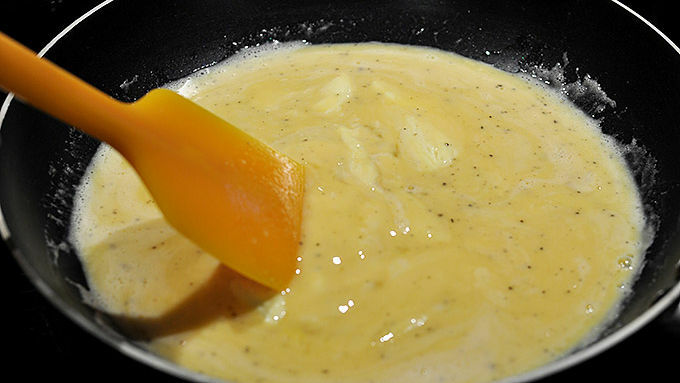 Remove pan from heat and add cream over the eggs. Using a soft spatula, continue to scramble the eggs in the hot pan until they are soft-set. Serve immediately. 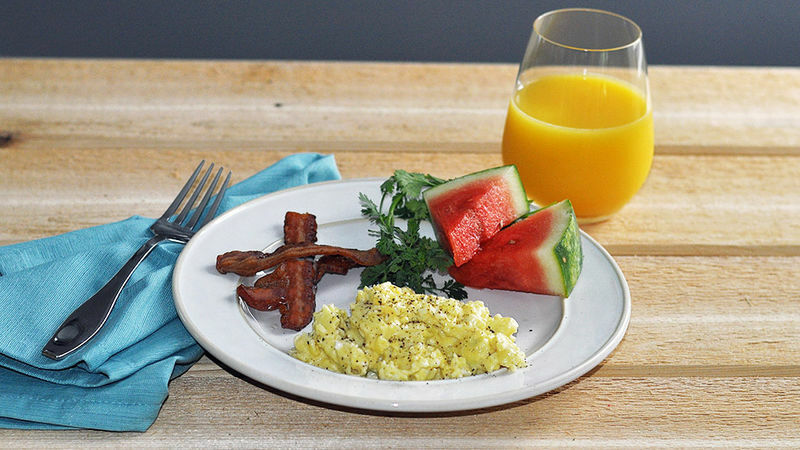 Make your scrambled eggs a whole new creamy and delicious way! When I visited Paris a few months ago, I expected to be over the moon about the Eiffel Tower, Louvre, Arc de Triomphe, and Champs-Élysées. And of course, those things did not disappoint. I even expected to fall in love with the famous cuisine, some of which I’ve tried making myself from my favorite Julia Child classic, Mastering the Art of French Cooking. What I did not expect was to be blown away by… scrambled eggs. Every morning we had these eggs in the hotel restaurant just around the corner from the Arc de Triomphe. And on the final day, I asked to speak with the chef. Through the English-speaking server, he told me this is how he makes these fluffy and irresistibly creamy eggs. And my breakfast shall never be the same. Never ever. All you need are some nice fresh eggs, milk, cream, salt and pepper. The important thing here is the cream. No substitutes! Consider yourself enlightened. From now on, it’ll be very hard to eat rubbery, dry scrambled eggs!